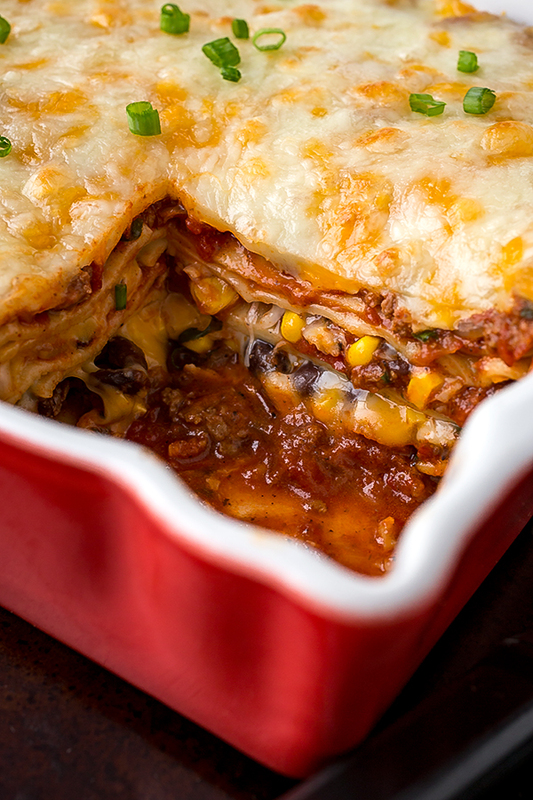 The coolness of the fall is the perfect time to bring in a little flavor of those warming spices we all love so much, and this Mexican Lasagna is a delicious little twist on the classic with lots of bold flavor perfect for the fall season. It’s that uniquely spice-scented time of year that I look forward to the most, the time of year that urges us to begin to pull out the cozy sweaters, and set our minds and appetites on those glorious holidays that lie just ahead. After a long, hot summer, nothing sounds as good to me as dropping temperatures, leaves changing color, cool early evening walks with my hubby, and the need to cover myself in a light blanket at night when we find the perfect movie to watch and grow sleepy to. And the food of the fall season is my favorite, as well. Bring out the apples, the spices, the pumpkins, and the squash! Though the summer offers up fresh produce full of juicy ripeness, the meals are a touch on the lighter side, because what we crave during the warmer months is typically a bit more on the refreshing side to cool the palette. But for fall, all sorts of decadent and divine options are now back on the table, options that include homemade sweets and desserts (time for the oven! ), cozy soups and stews, delectable and veggie-ful casseroles, and unique lasagnas prepared in new and exciting ways. The fall season is so much about food, isn’t it? Maybe that’s why it touches my heart so very much. 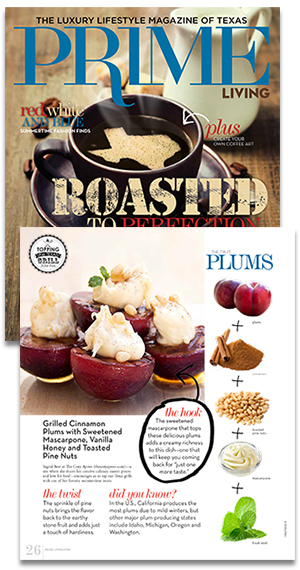 While we do our best to be as “good” and health conscious as possible beginning with the new year, spring and into summer, by now, as we begin to sense the holidays slowly approaching, we turn our attention more to recipes that will comfort, inspire, warm, and nourish; and nothing says all of that like the food of fall. In the cooler months of fall, I tend to favor making use of “warming” spices, and the bold, vibrant flavors that they impart on the recipes that they’re added into. Fire-roasted vegetables, rich sauces, cheeses, and heartier, more filling additions will tie a meal together so perfectly, and re-introduce us to getting back to being cozy in our kitchens, and together at our tables as the twilight falls ever earlier in the day, beckoning us to get comfortable in our homes, those private dwelling places where our hearts can always be found. And little says “home” like lasagna, isn’t that true? It’s one of my favorite dishes to prepare in fun, new ways. As a matter of fact, one of my most popular recipes on the blog has been this Autumn Lasagna, which I enjoyed creating specifically to utilize the brilliant orange color that’s unique to fall, not to mention the special flavors it brings with it. 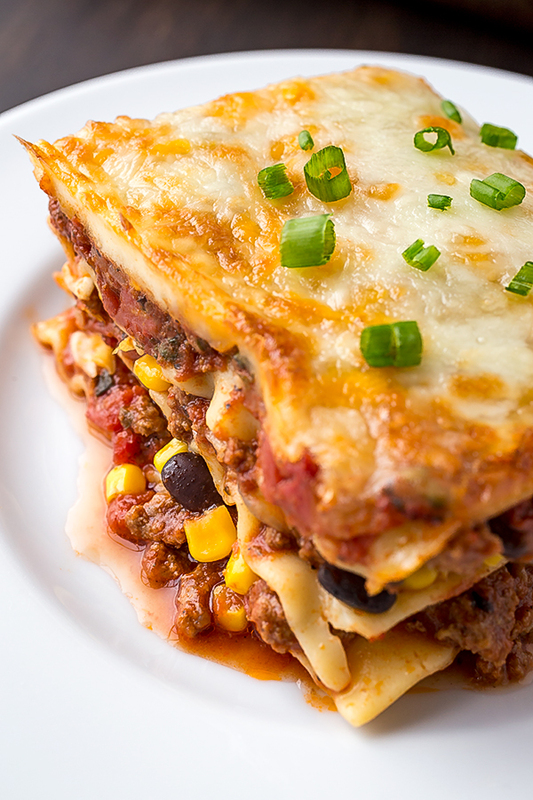 And so for this fall season, I thought I’d spice things up just a little and combine many of my favorite south-of-the-border flavors into a hearty, warming, rich, and cheesy lasagna that everyone will enjoy. 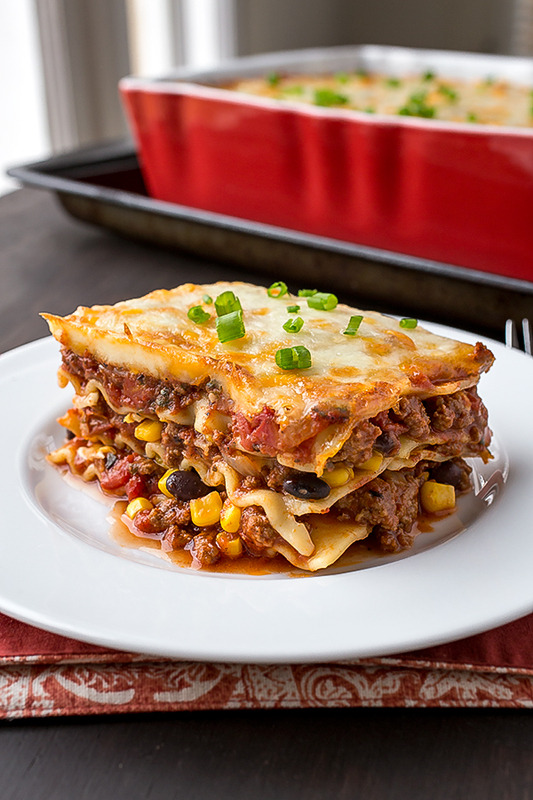 Seasoned ground beef is combined with a savory and smoky fire-roasted tomato sauce kissed with green chilies; the filling is chockfull of black beans and sweet corn, with a cheesy topping of a mozzarella, cheddar, and jack cheese blend. 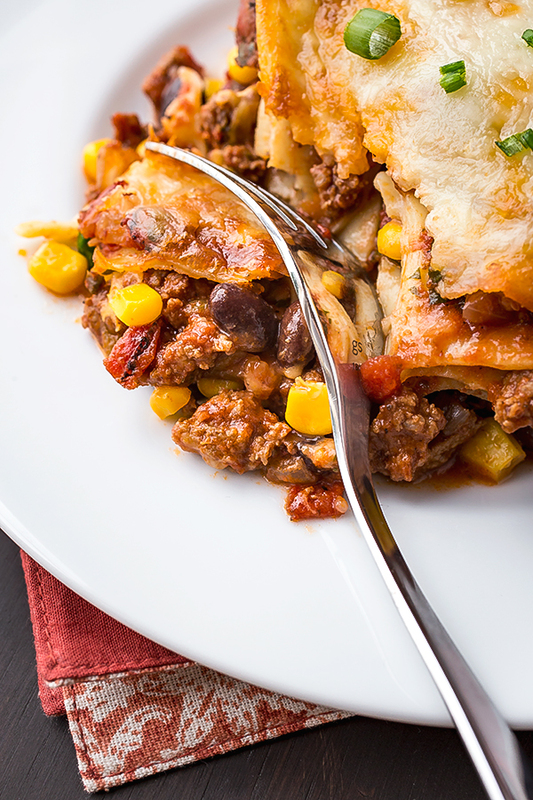 Add a few fresh, green sprigs of cilantro, and the classic lasagna takes a Mexican turn and becomes a deliciously balanced, comforting, and kissed-with-spice meal. So, I don’t know about you, but I’m definitely about ready to bring in the fall season, and to put some spice into it, as well. I’m ready to fashion a warm space in my kitchen to enjoy spending time in, and to create an environment that will be conducive to comforting not only my own belly and heart, but the bellies and hearts of all of those that I love and long to nurture and nourish. -Preheat oven to 350°, and prepare a large casserole or baking dish. -Place a large skillet or saute pan over medium-high heat, and drizzle in about 2-3 tablespoons of the oil; once hot, add in the onion, and saute for several minutes until it begins to become softened. -Crumble in the ground beef, breaking it up with a spatula or a wooden spoon, and stir it into the onions to cook for a few minutes; once the meat is no longer pink, add in a couple of good pinches of salt and pepper, plus the cumin, coriander, chili powder, and oregano, and stir to incorporate. -Stir in the garlic and the diced chilies, and once the garlic becomes aromatic, add in the tomato paste, and stir to combine, cooking the paste for about :30-1 minute. -Add in the fire-roasted tomatoes with their juice, stir, and allow the sauce to very gently simmer for about 5-10 minutes. -Finish the sauce by adding in the chopped cilantro, and taste to make sure you have enough salt/pepper. 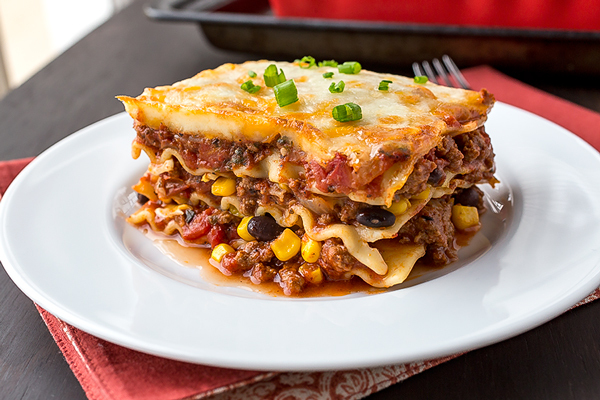 -To assemble the lasagna, add a little of the sauce to the bottom of your baking or casserole dish, then place 4 cooked lasagna noodles on the bottom; next, add a bit more sauce, then about half of the black beans and the corn, followed by about a cup’s worth of the cheese; do another layer the same way. 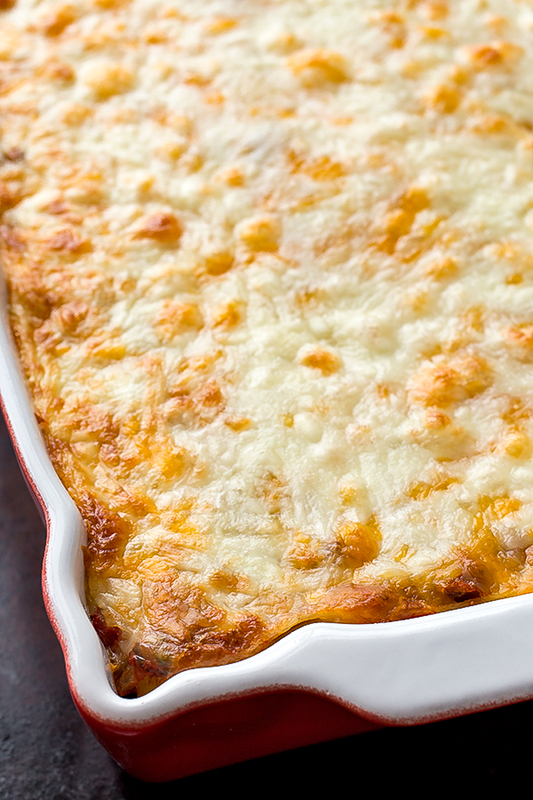 -Layer on the third (and final) layer of lasagna noodles, then the rest of the sauce, followed by the remaining 2 cups of cheese, and place into the oven to bake for about 20-25 minutes, or until the cheese is melted and gooey. 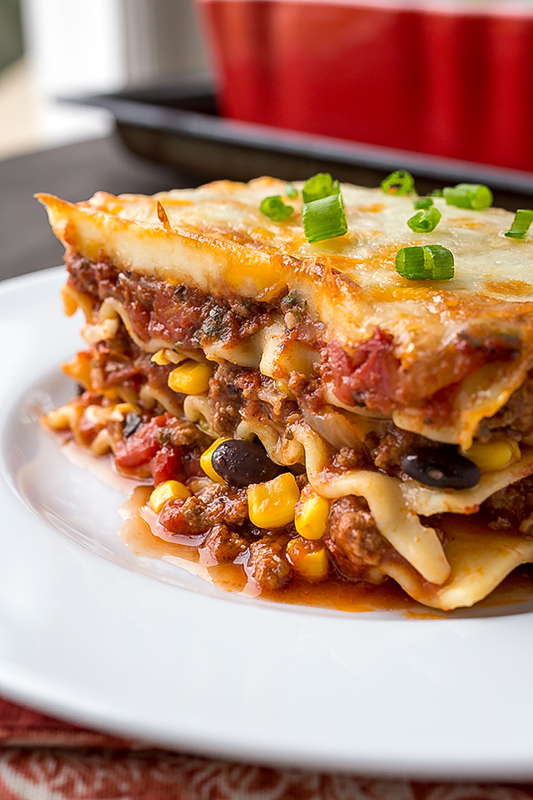 -Finish the lasagna with a sprinkle of green onion, plus a few cilantro leaves, and serve. Wow! Very yummy! I bought fresh pasta sheets from whole foods and used those as my noodles. No need to cook them first and the taste is great. 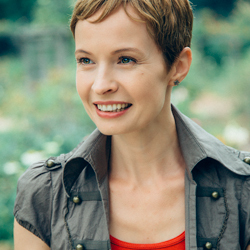 Thanks Ingrid for all your wonderful and inspiring recipes.